When I first started out, I had no formal fine woodworking training, nor any mentors from which to draw. I remember watching a woodworking video (yep, VHS back in the day) with Frank Klausz showing just how quick and easy it is to hand cut dovetails. 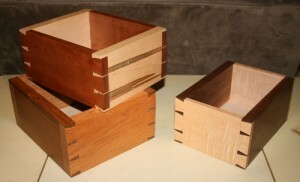 Of course, after watching that, I had to go buy a back saw, so I could make some exquisite dovetailed pieces. I went to our local fine woodworking store and bought what looked like a reasonable candidate. NOT! I practiced and practiced with my saw, but I just didn’t seem to get any better. The saw cut extremely slowly and seemed to have a mind of its own when I tried to cut to a line. OK, fast forward to present day. I bought my first Lie-Nielsen dovetail saw (15 ppi .020 thick plate) about five years ago. I had the opportunity to briefly try out one of the new Lie-Nielsen dovetail saws when a friend brought his into our club meeting. It felt like it could make a difference in my skills. After deciding to make my purchase, I couldn’t wait to try out my new saw. The first thing I noticed was just how good the beautiful maple handle felt in my hand. I started out by marking some vertical cuts and a series of angled cuts to run through to get the feel of my new saw. Next I laid out a couple of tails on a board and started cutting. It was just amazing how much difference my Lie-Nielsen saw made. After grabbing a second piece of wood, and verifying that my first dovetailing attempt wasn’t just a lucky fluke, I decided to see what was different about my two saws. First off, the dovetailing operation is usually cut with a rip tooth configuration, since the cuts are primarily with the grain. When I checked my first saw, I noticed it was filed with cross-cut teeth rather than with rip teeth. (There was that lack of experience on my first purchase!) The thickness of the saw plate was a bit over 1 1/2 times as thick as my Lie-Nielsen saw. My original saw was .032” thick, while my first Lie-Nielsen saw is .020” thick. One other difference that really seemed to be a deal breaker was the amount of set each tooth has, which is where each alternating tooth is bent slightly to the opposite side. My old saw had about .005” of set on each tooth, which allowed the saw to float around in its own kerf, making accuracy extremely difficult. The Lie-Nielsen saw has .003” set on each tooth. This provides enough room so the saw plate doesn’t bind, but not so much that it wanders on its own. Once you start sawing with the Lie-Nielsen saw, it tracks extremely straight. Lie-Nielsen has an extended line of dovetailing saws. Their first pistol grip handled version has 15ppi teeth and a saw plate thickness of .020”, the next in this line has a progressive pitch tooth pattern (16ppi at the toe progressing to 9ppi at the heal) with the same .020” plate, and the most recent version has the 15ppi teeth but a .015” thick plate. Lie-Nielsen also makes a dovetail saw with a straight handle. This saw has 15ppi and the saw plate is .015” thick. All of these saws do a great job and ultimately choosing becomes a personal preference. I personally prefer the pistol gripped version, compared to the straight handle, as the pistol grip style provides direct feedback as to the position of the saw plate. I would suggest coming to one of our events and trying all four saws, so you can each determine your own preference. Oh, and just a brief blurb from Frank Klausz, while demonstrating cutting dovetails at our local club meeting a couple of years ago. Frank mentioned the Lie-Nielsen dovetail saw seems to be a bit too sharp when it is new. After he’d used it to cut a couple of hundred dovetails, he said it felt about right. I think this provides a bit of insight as to just how long the Lie-Nielsen saws may stay sharp. I hope to see some of you at one of our upcoming events, listed at Lie-Nielsen.com. To take a closer look at the Lie Nielsen dovetail saws, click here and here.